Miami, San Francisco, New York: Is A Housing Bubble Coming? Are housing bubbles reinflating in 3 major cities? Home flips increased in 75 percent of U.S. markets and accounted for 5.5 percent of all U.S. home sales in 2015. Home prices in the Bay Area have fallen for the first time in five years. In the first fourth months of 2016, NYC builders added another 4,200 new building permits. Just 10 years ago, easy credit and lax banking lending standards in the U.S. residential real estate market were partly to blame for a housing bubble that popped and caused over 7 million borrowers to lose their homes to foreclosure during the 2008 housing downturn, which triggered the Great Recession and unleashed a global financial meltdown. Today, housing prices are steadily increasing again due to a shortage of new and existing homes for sale. And in some regions of the United States, home prices are seriously overvalued, especially in coastal communities such as San Francisco, New York and Miami. According to Barron’s, home price increases have been fueled by real estate investors searching for yield in a low interest rate world and by foreign investors seeking a safe haven to store cash. Rising home prices are bringing out more home flippers too. Last year, 180,000 home were flipped, according to RealtyTrac. Home flips increased in 75 percent of U.S. markets and accounted for 5.5 percent of all U.S. home sales in 2015. Last year was the first increase in flips in four years. Home flips increased in 75% of U.S. markets and accounted for 5.5% of all U.S. home sales in 2015. Now, the question many experts are asking is no longer if, but rather when and how far, home prices will fall in the coming housing crash. Nationwide, we are not in a bubble, but some markets are getting frothy, experts claim. 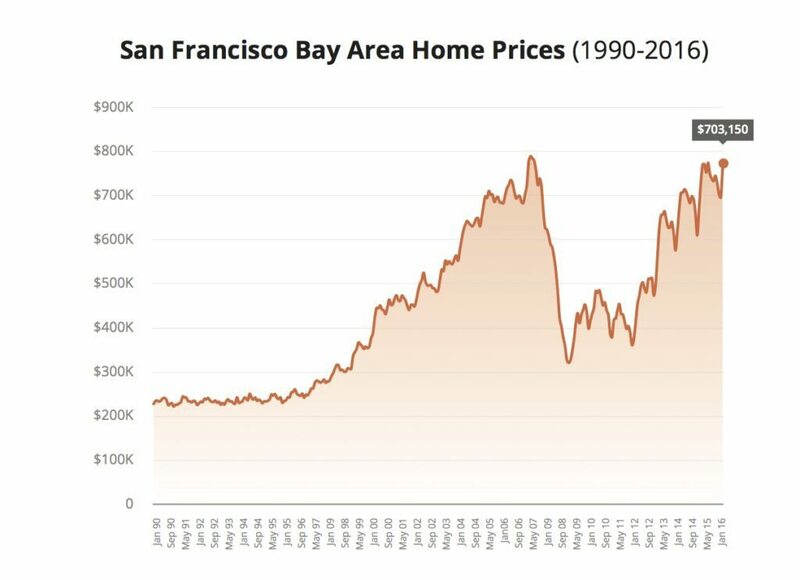 For years, it looked like San Francisco real estate boom would never end, but the tech go-go days might be slowing down, as home prices in the Bay Area have fallen for the first time in five years. In San Francisco County, the median price of a single family home has nearly doubled since April 2006, ballooning from $900,442 to $1.4 million in April 2016, according to California Association of Realtors (CAR). In Marin County, the median price has jumped from $985,072 to $1.2 million. And San Mateo County home prices have inflated from $798,387 in April 2006 to $1.3 million in April 2016. Statewide, only 34 percent of families can actually buy a home today in the Golden State. It’s worse in San Francisco, where prices have risen so fast that only 12 percent can afford a home in Q1 2016, according to CAR‘s affordability index. In Los Angeles, only 31 percent can afford to buy, while Orange County 22 percent can afford a home. Statewide, only 34% of families can actually buy a home today in the Golden State. But San Francisco incomes can’t keep pace with rising home prices. The median household income in San Francisco is $78,000, according to the Census Bureau. 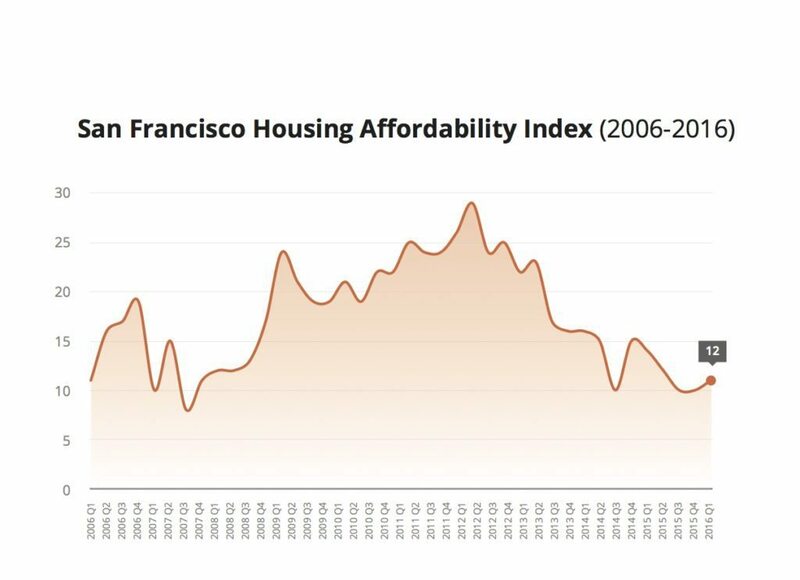 That means that the price-income ratio that historically nationwide has been three times is more than 10 times the median household income in San Francisco. Thanks in large part to the rise of Silicon Valley, San Francisco is now a city of moneyed technology workers, where hordes of Chinese and Indian nationals, with their newly minted H-1B work visas, are flooding the Bay Area seeking high-paying jobs and unaffordable housing. To understand how tech money is transforming San Francisco’s rabid housing market, look no further than the super-charged real estate market. As technology companies have moved in — Apple, Google, Facebook, Twitter, to name a few — the influx of high-paying workers has pushed rents and home prices through the roof. Google minted 1,000 millionaires when it went public in 2004. In 2012, Facebook’s IPO created 1,000 millionaires too. Twitter added 1,600. But the San Francisco venture capitalists are starting to get nervous. Twitter is laying off people. Yahoo is for sale and downsizing too. Numerous other tech companies have started the same process. This year’s dramatic drop in tech stock sucked some of the life out of San Francisco’s real estate market and created conditions for further decline in home prices, according to local real estate experts. Ken Rosen, chairman of the Fisher Center for Real Estate and Urban Economics at U.C. Berkeley, said the San Francisco real estate market is interconnected with global markets. Any slowdown in international markets, especially China, will affect the local Bay Area real estate market. Like San Francisco, Manhattan’s real estate market has been sizzling several years. But now cracks are starting to show in the once red-hot real estate landscape. Price growth is starting to slow amid concerns of a supply glut, particularly in $5 million and above luxury market. Inventory is rising and the global economy is starting to show signs of strain. Jonathan J. Miller, president and CEO of Miller Samuel Inc., a real estate appraisal and consulting firm, said a bit of a chill has set in the New York City residential real estate market. Miller said the high-end luxury market is small sliver of the overall market. He said “chronically low inventor” was pushing prices higher. According to Real Estate Weekly, Manhattan’s skyline is filled with construction cranes, with 70 cranes dotting Gotham’s skyline building high-rise residential developments. This construction boom is confirmed by Census data. In 2014, New York developers were issued 47,984 building permits. Last year, at 86,400 new building permits, developers nearly doubled the number of New York new building permits. In the first fourth months of 2016, builders added another 4,200 new building permits. Miami: Condo bust looms — again! In Miami, the Brazilians, Canadians and Russians have disappeared just as a new crop of high rise condo towers are hitting the market. Miami condo developers are starting to cancel projects, slash prices and offer incentives to spur sales, according to Jack McCabe, a Florida-based real estate analyst with McCabe Research and Consulting in Deerfield, Florida. McCabe, who called the last housing crash a decade ago, believes the luxury condo market is in a bubble. He said the South Florida housing scene looks eerily similar to the 2008 housing bust, and the inventory of unsold luxury condos is ballooning. But instead of the U.S. housing market taking down the global economy; the global economy will crater South Florida’s housing market this time, claims McCabe. With the disappearance of international buyers, McCabe worries that South Florida’s real estate market is drifting back into bubble territory. “In the upper-end condo market, we are in the ninth inning,” said McCabe, using a baseball analogy to describe the slowing Miami luxury condo market. South Florida is in a big bubble for high-end condos. Read the full article and more in RealtyTrac’s monthly Housing News Report. Octavio Nuiry is the managing editor of RealtyTrac. Will oil slump hurt Texas housing?